In this article, we are describing in details how to integrate Apple Pay into an iOS app. We’ll code in the latest version of Swift and the code samples are extracted from our beautiful app templates, many of which have built-in support for Apple Pay. Feel free to download them directly, if you want to skip the hassle of learning how to integrate Apple Pay by yourself. Apple Pay was a game changer! Besides reducing immense friction when it comes to payments in physical stores, it also simplifies check out forms, facilitating in-app purchases of physical goods, such as clothing or groceries, as well as services (such as hotel bookings, tickets purchasing, gym memberships, etc). Configure your environment, by creating a merchant ID with Apple as well as a Payment Processing certificate. You can achieve all the steps required for these by following Apple’s detailed instructions. Once you’ve completed all those instructions, go to step 2. Make sure you’re generating a certificate file and you open it in your Keychain Access. And many others. Check out the definition of PKPaymentRequest for the full list of features. 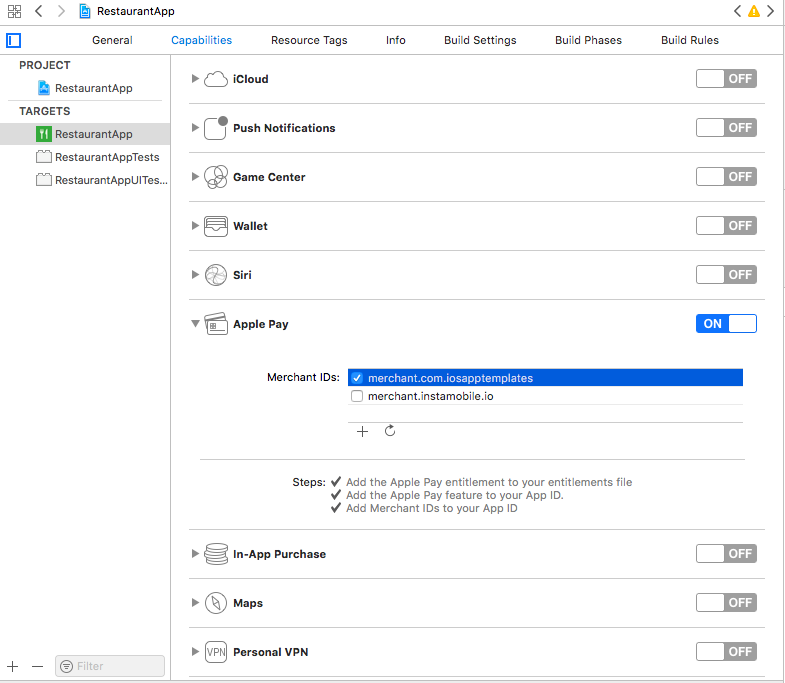 Once you’ve successfully initialized a payment request, you can use it to instantiate a PKPaymentAuthorizationViewController, which will take care of displaying the Apple Pay UI as well as authorizing the payment. All the interactions with the user are being managed by this view controller, so there’s no more extra work for you. (Optional) Subscribe to payment events via PKPaymentAuthorizationViewControllerDelegate. You can implement the methods in this protocol if you want granular notifications for what the user is doing. You have triggers for when the authorization finishes, shipping method changes, shipping contact updates, shipping address changes, payment method selections, etc. Check out the interface of the protocol to see what extra information Apple Pay provides for developers. //  Created by Florian Marcu on 6/26/18. //  Copyright © 2018 iOS App Templates. All rights reserved. Nice and easy, isn’t it?